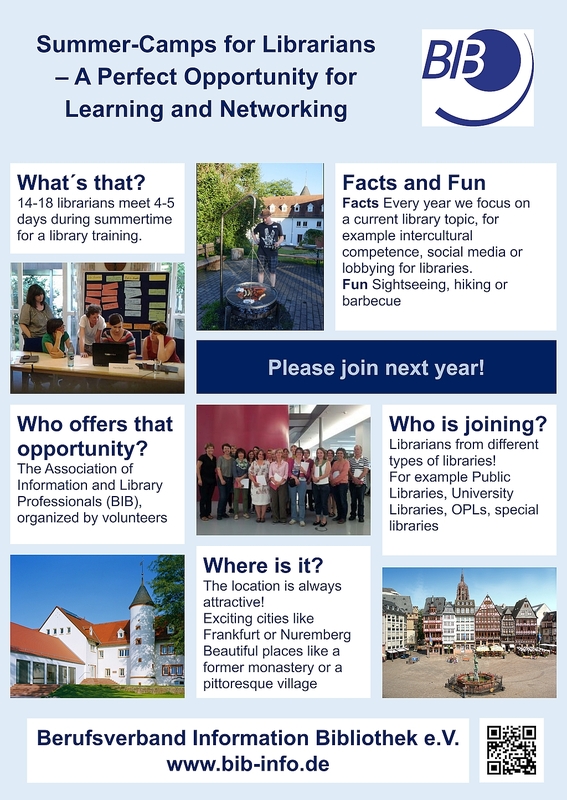 KRASS, Ulrike (2017) Summer-Camps for Librarians – a Perfect Opportunity for Learning and Networking. Paper presented at: IFLA WLIC 2017 – Wrocław, Poland – Libraries. Solidarity. Society. in Session 112 - Poster Sessions. To make library training attractive and efficient, the Association of Information and Library Professionals (BIB) in Germany offers multiple formats. The most exceptional one is the annual summer-camp which celebrates its 20th jubilee in 2017. 14-18 participants meet 4-5 days in summertime at a place, which is situated either in a lovely landscape or an exciting city. The organizers are volunteers of BIB. Every year we focus on a current library topic, for example intercultural competence, social media or lobbying for libraries. In addition to professional training we offer cultural events or outdoor activities for integrated learning embedded in a lovely landscape. 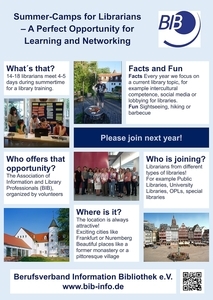 The participants do have the opportunity to exchange work experiences, build and extend networks and find new friends in the group of librarians. The mixture of professional input and common experiences in the group is the essence of the summer-camps and can be exemplary for other countries. The visual presentation aims to attract and is designed to animate other institutions to initiate similar ways of further education.